Just north of The Forge and west of North Gate you can find The Brewery, a place which is “sacred” to many dwarves. The Brewery takes advantage from the nearby Farms, where the dwarves produce cereals for their stout ale and a unique kind of mushroom which gives to the stout ale its flavor. Many ingredient storage chambers are smartly placed on the west side of The Brewery.In The Brewery there are giant rooms for aging the stout and minor distilleries for produce other, less famous but not less tasty, liquors. A unique tavern, called “From the Hands of the Stout God” serves fresh stout and liquors to customers. 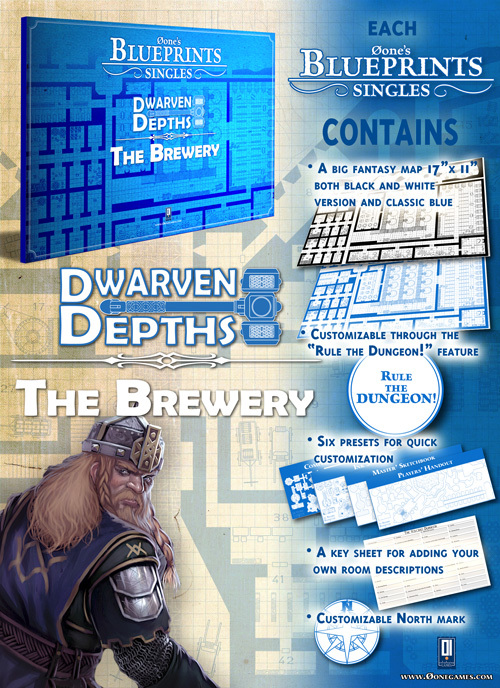 Needless to say, this tavern is ever-crowded, even the dwarves usually do not tell anyone of its existence. A small garrison guard this area since small groups of goblin thieves, coming from abandoned excavation to the west, usually try to steal barrels of stout from the aging areas.